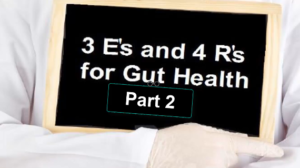 This is part two of a two part blog post on the 3 E’s and 4 R’s for gut health. This is your road map to dramatically improve your gut microbiome. and reducing the potential for a wide range of autoimmune diseases. All by effectively changing your gut microbiome. If you missed this blog post on the 3 E’s, then click here to either read the post or watch the video..
It’s these 3 conditions that you have to address. If you address them properly, then you’ll experience a tremendous shift in your overall health. And you can gain this knowledge in one of two ways. Either as a video, which is posted below. Or as a blog article, which you’ll find after the video. This allows you to choose the method of communication that works best for you. Let’s start with our first R, which is Remove Foods and Factors That Damage Your Gut. When you change your microbiome to a healthy environment, you will find it much easier to make good food choices! Why? – Because your microbiome is driving your food choices. If you desire sugary drinks and processed snack foods it’s because the microbiome of your gut is influencing your choices and what they want to eat. Fix the Gut You Fix the Problem! Eliminate all wheat products from your diet – this will immediately help you eliminate inflammation and dysbiosis. Reduce your sugar consumption – this will help you address inflammation and dysbiosis and reduce toxins that can contribute to a leaky gut. Dramatically reduce your intake of vegetable oils – this will address inflammation and leaky gut. Limit your consumption of animal protein – this will help address dysbiosis. Limit your alcohol consumption – this will help address dysbiosis. Only use an antibiotic when necessary – this will help address dysbiosis. Only take medications when necessary – this will help address dysbiosis. Reduce your stress level – this will address all 3 E’s as it lowers inflammation, removes the potential for dysbiosis, and helps to prevent leaky gut. The Next Step is to Replace With Healing Foods – As you remove foods that are harmful to your microbiome, replace them with foods that will quickly recolonize your microbome with healthy and beneficial bacteria. Here are some suggestions. Increase Your Water – by adding Liquid Chlorophyll. Add 1 tablespoon of liquid chlorophyll per 16 ounces of water. This will help address inflammation. Replace Milk with Unsweetened Almond Milk – This will address dysbiosis and inflammation. And for most people Almond Milk is a fairly easy change. Increase Your Consumption of Vegetable Protein – this will address dysbiosis and inflammation as well as help heal a leaky gut. One of our favorite sources for vegetable protein is Pea Protein Powder. Especially if you make any type of healthy shake or smoothie. It’s important to note that pea protein contains three times more L-arginine (1538 mg per 25 grams) than whey protein (461 mg per 25 grams). This is significant because L-arginine fuels 7 different metabolic pathways that are important for good health. And, this amino acid is so important to your health that I did a separate video called The Truth About L-arginine. You’ll find a link to this video below. Now let’s continue with key healing foods. Switch to Omega-3 Fats – substitute your omega-6 fats like vegetable oils with extra-virgin olive oil or coconut oil. Avocados are also an excellent source of omega-3 fats. This will address inflammation and help heal a leaky gut. Add Fermented Foods – which addresses dsybiosis as well as reduces inflammation. Greek yogurt, Kefir, sauerkraut, and pickles are all good food choices. Add Flax Seed Powder – to address inflammation and dysbiosis. This can easily be added to your food and health shakes. Consume More Vegetables – whole and unprocessed vegetables help address both dysbiosis and inflammation. Eat more spinach, broccoli, cauliflower, peas, and raw carrots. However, stay away from corn because of its sugar content. Next is to Repair With Specific Supplements – There are so many supplements in the market that it would be easy to get lost in this area. We’re going to give you just 4. But they’re the four most important ones to consume to help you address the 3 E’s. L-Glutamine – This is always the first and most important one to add to your diet. It will address inflammation, leaky gut, and dysbiosis. Also, L-glutamine improves the ratio of good bacteria (bacteroidetes) to bad bacteria (firmicutes) to aid in weight management. Magnesium – This mineral addresses inflammation, leaky gut, and dysbiosis. It’s required for the function of hundreds of enzymes in the gut to improve digestion, regularity, and energy production. Zinc – This mineral addresses dysbiosis by helping to fuel the enzymatic processes that help recolonize your gut microbiome with healthy, beneficial bacteria. It’s involved in over 300 different enzymatic pathways to help support optimal health. Borage Oil – This nutrient addresses inflammation. Inflammation is such a big issue in gut health that you want to arm your microbiome with the nutrients it needs to address this issue. Finally you need to Rebalance With Prebiotics and Probiotics – We recommend combining these two together to optimize the recolonization of your gut microbiome. Let’s start with Probiotics, which are the good bacteria you need to recolonize your abdominal cavity. And when it comes to Probiotic supplements, there’s always the debate about live cultures that have to be refrigerated versus shelf stable cultures. Regardless of which one you choose, they all must pass through the stomach, which presents a problem. Due to the high acidic nature of the stomach, many of the probiotics don’t survive the journey to the small intestine. This is one reason why you have to take such a large number of active cultures – say 50 billion CFU or colony-forming units. However, by taking your probiotics with food or dark chocolate, you increase the number CFUs that make it into the small intestine. And the reason why is sugar helps coat them to provide protection from the acids of the stomach. But sugars also feed the bad bacteria that you’re trying to get rid of. Which brings us to Prebiotics. Prebiotics are non-digestible carbohydrates to you, but can be digested by probiotics. They are usually soluble fibers, which aid you in your digestion. When combined with water, they form a gel like substance that can withstand the acidic environment of the stomach. And when they enter the small intestine they become a meal for the bacteria you’re trying to grow. This means you want prebiotics that will nourish the good bacteria, not the bad bacteria. And if you properly combine a prebiotic with the correct probiotic, you can create a positive synergistic effect. The prebiotic will form a gel-like coating to protect the probiotic through the stomach acids. This helps more CFUs to make it into the small intestine. Once in the small intestine, the prebiotic becomes a healthy food source for the probiotic. This speeds the colonization of your gut microbiome with good bacteria while denying your bad bacteria the food they need. This helps to quickly reset your gut health so you can enjoy improved wellness. So which are the best ingredients for doing this? Inulin – is an excellent Prebiotic. It’s always our first choice. In addition to nourishing the good bacteria it also assists with the digestion and absorption of your food. Inulin plays a significant role in your immune system. And it seems to improve heart and bone health, reduce the potential for colon cancer, helps protect against inflammatory bowel disease, and aids in preventing constipation. For a Probiotic, Bacillus Coagulans is our first choice. We know that there are others in this category but if you want to rapidly recolonize your gut microbiome, then this is the one to use. This is a spore-forming probiotic species that can withstand the stomach’s acidic environment so when it enters the intestinal area it can colonize faster. And, Bacillus Coagulans have been shown to help reduce irritable bowel syndrome, Crohn’s disease, and inflammation. Fix the Gut and You Fix the Problem! If you have any questions about the material I shared with you today, then please either email me at dan@agingnomore.com or call me directly at 630-936-8079.